Received January 24, 2017; Revised March 5, 2017; Accepted March 7, 2017.; Published online March 17, 2017. Under pathological stimuli, activated microglia exhibits a directional migration toward the site of injury using chemo-attractant gradient as a directional cue. The motility of microglial cells is regulated by intracellular signals through various signaling cascades including receptors and kinases. Even though intracellular signals underlying the regulation of microglia chemotaxis are still not well understood, many attempts focusing on revealing and understanding signaling pathways controlling microglia chemotaxis have been made in recent years. 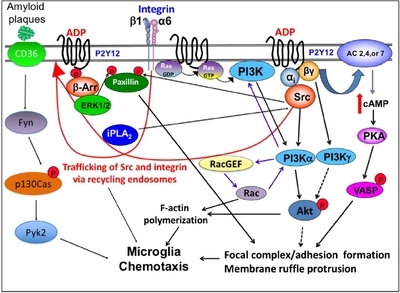 Signaling pathways reported to be involved in the regulation of microglia chemotaxis were depicted in a diagram (Fig. 2). Fig. 1. Microglia are derived from primitive hematopoiesis in the fetal yolk sac and take up residence in the brain during early fetal development. (B) Two functionally different activation states of microglia. 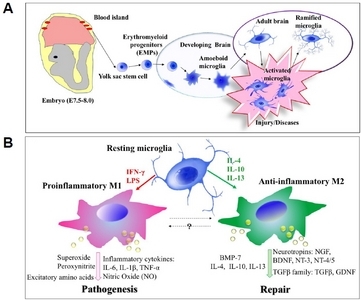 In the presence of LPS and IFN-γ, microglia cells are activated to M1 phenotype and result in production and release of pro-inflammatory cytokines such as TNFα and IL-6, MMP-9, NO, and ROS. In contrast, IL-4 and IL-13 induce alternative activation of microglia to M2 phenotype which downregulates the M1 phenotype and includes tissue repair and extra-cellular matrix composition. Fig. 2. Chemoattractant (ADP or ATP) triggers signaling by activating its specific Gi/o-coupled receptor, P2Y12, which leads to the elevation of PI(3,4,5)P3 by the activation of PI3Kα via Gαi and PI3Kγ via Gβγ, leading to the activation of Akt. Ras is activated at the leading edge and also important for the activation of the PI3K pathway. Gβγ released from Gαi also can elevate intracellular cAMP by the activation of AC, causing VASP phosphorylation by PKA. Activation of Src via Gαi causes phosphorylation of paxillin at Tyr31, which is essential for focal adhesion assembly. ADP stimulation of P2Y12R recruits β-arrestin which recruits and activates ERK1/2. ERK1/2 phosphorylates Ser83 of paxillin that is required for adhesion disassembly. Activation of P2Y12R increases iPLA2 activity which is required for the vesicular recycling of integrin and Src. Zhang, X., Qin, J., Zou, J., Lv, Z., Tan, B., Shi, J., Zhao, Y., Ren, H., Liu, M., and Qian, M. (2016). Extracellular ADP facilitates monocyte recruitment in bacterial infection via ERK signaling. Cell Mol Immunol.